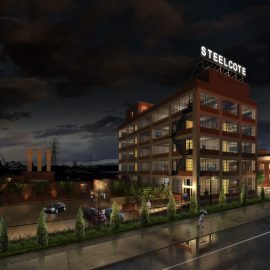 If plans come to fruition, more than half a million square feet of science and technology space will replace the current site of U.S. Metals & Supply within the Cortex district. 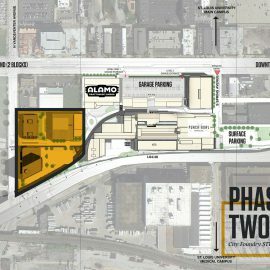 The nearly seven-acre site would be home to a total of three new technology buildings as well as a smaller retail building and a large parking garage. The site encompasses the entire block between Wexford Science & Technology’s @4240 building and Sarah Street along the south side of Duncan Avenue. The region’s first Ikea, announced late last year, is being built a block to the east. The development will replace a current U.S. Metals and Supply manufacturing factory. The site plan shows the area cleared and rebuilt, apparently taking the U.S. Metals office building fronting Sarah as well. The City’s TIF Commission recently approved a $4.2 million tax incentive to purchase and demolish that facility. Of the proposed new construction, Building 1 will be a five story 200,000sf structure with first floor retail fronting Duncan. 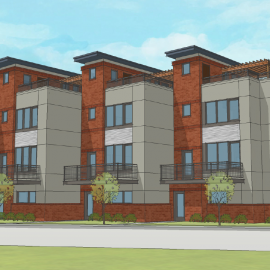 Buildings 2 and 3 will also be five stories, and 151,250sf each. Building 2 will also have first floor retail facing Duncan. The three buildings will be connected. An 11 story, 2,450-space parking garage with facilities for cyclists will sit against the light rail tracks at the back of the site. A new MetroLink station is planned for the southwest corner of the site with access from both Sarah and Boyle Avenues. 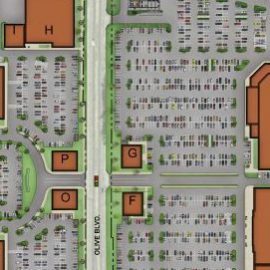 CORTEX has largely followed the land use plan produced several years ago (below), but this project would be significantly larger than initially planned. Once earmarked for 340,000sf and 1,100 jobs, square footage has increased by nearly 50 percent, and the 2,450 parking spaces allude to significantly more jobs. The garage wouldn’t be particularly convenient as a park-and-ride facility. The sale of the property closed in December. City records list the owner as Wexford Science and Technology of Baltimore, Maryland. Wexford developed the @4240 property next door. That building is leased to near capacity with strong demand. Given the amount of space and parking involved, Wexford is expecting several thousand new jobs. It is unknown whether they have a single large client in mind or (like next door) numerous smaller clients. Until a public announcement is made, plans could fuel speculation as to what technology company or companies are planning for several thousand new research and technology jobs in St. Louis. The location, in the heart of Cortex, next to Wexford, Cambridge Innovation Center, Saint Louis University and the Washington University School of Medicine, hospitals, as well as Ikea and on a MetroLink light rail station, is proving to be one of the region’s best magnets for new jobs and development. Cortex is establishing a history of quickly completing projects once public. From the Cortex website: Since inception, Cortex has completed or has under construction 1 million square feet of new and rehabilitated space totaling $350 million of investment and generating 2,500 technology-related jobs. A new Interstate 64 interchange and public park together with streetscape improvements will be completed by April 2014. When fully implemented, the Cortex master plan projects $2.1 billion of construction, over 4.5 million square feet of mixed-use development (research, office, clinical, residential, hotel, and retail), a new MetroLink light-rail station and 13,000 permanent technology-related jobs. The U.S. Metals blue building, and the historic office are now gone. The expansive site will be a temporary surface parking lot as construction continues to be juggled at Cortex. Below is an updated plan for the site. Facade shown faces west toward the existing 4240 Duncan building, while the aerial image looks northeast. 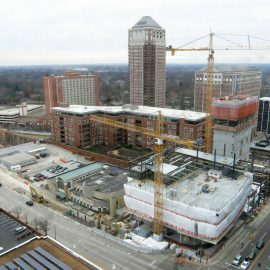 According to sources, the large central mass is a parking garage to be built in phases as needed. The four surrounding buildings are planned as office.